Our Forager Pour-Over Soup is Autumn in a bowl. Butternut squash, pumpkin seeds, and fire-roasted tomatoes are warmed slightly and deliver a sweet, tart and incredibly savory soup. Whether the leaves are changing, or have already left, this Signature Steamer is sure to be a cozy comfort when the breeze has turned to a chill and your jean jacket is barely enough to keep you warm. Our Pour-Over Soups are the most nutrient-dense soups on the market! We pour our house-made vegetable broth over a fresh salad only after you place your order, that way the broth only steams the veggies, thus, keeping most of the nutrients intact. Specifically for the Harvest Soup, we would like to highlight butternut squash. Butternut squash is one of the richest sources of vitamin A and beta-carotene, which are essential for a healthy immune system and provide great vision and healthy skin benefits. But let’s not forget, the Harvest Steamer is also a great source of protein, heart-healthy fats, and vitamins K and C.
A unique blend of buckwheat noodles and nutrient-rich veggies, the Sesame Ginger Pour-Over Soup is our take on pad Thai, only this one is 100% plant-based and loaded with good-for-you ingredients. Savory, sweet, and nutty all at once, this Signature dish is a well-balanced blend of Thai flavors and personality. 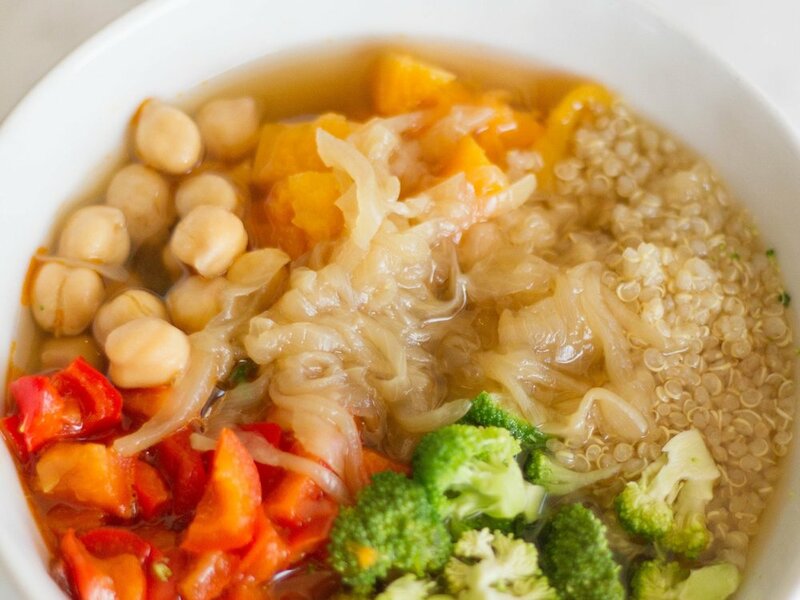 Our Pour-Over Soups are the most nutrient-dense soups on the market! We pour our house-made vegetable broth over a fresh salad only after you place your order, that way the broth only steams the veggies, thus, keeping most of the nutrients intact. The Sesame Peanut Soup is a unique blend of nutrient-dense vegetables, including vitamin-K-rich spinach, vitamin-C-rich red pepper, beta-carotene-dense carrots, and heart-healthy peanuts. However, its true stars are the delicious buckwheat noodles, which are gluten-free and full of fiber, protein, folate, magnesium, manganese, and B-complex vitamins. Zesty, zippy, and zany, our Southwest Pour-Over Soup is full of life, fresh, and nutrient dense. Black Beans, snappy corn, red peppers, green onions, tart tomatoes, and luscious avocado make this Signature dish a perfect and satisfying soup for all our Mexican-food lovers! Our Pour-Over Soups are the most nutrient-dense soups on the market! We pour our house-made vegetable broth over a fresh salad only after you place your order, that way the broth only steams the veggies, thus, keeping most of the nutrients intact. Specifically, the Southwest Soup stands out because of its well-balanced and complete nutrition, with heart-healthy fats from the avocado, fiber and protein from the beans, and complex carbs from the wild rice.